“This is one resource I would not be without” – Cherri Moseley, Primary Mathematics. Developed as part of Brenda Keogh and Stuart Naylor’s Active Assessment project that has transformed assessment in classrooms in the UK and beyond, this resource uses a highly creative approach to integrate assessment and learning in maths lessons. This book provides useful information on the relationship between assessment and learning. Stuart and Brenda invited me to co-create Active Assessment in Maths and this book is the result and a rather splendid one too! 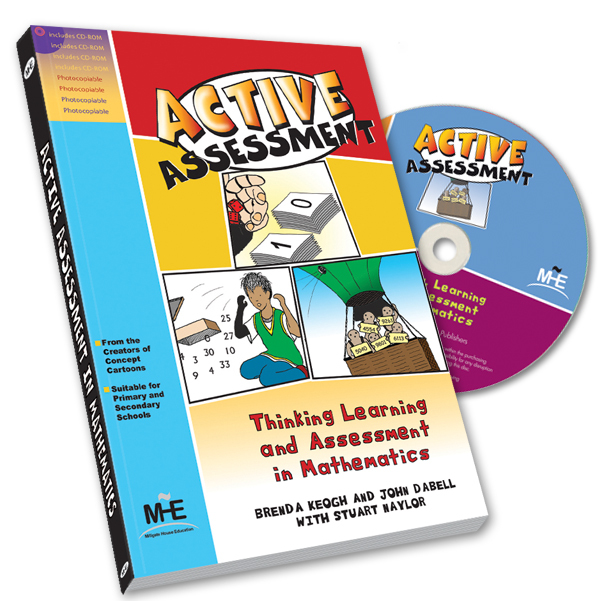 Active Assessment in Maths book and CD-ROM pack is full of resources for teaching maths. 36 different strategies are illustrated in more than 108 black & white activity sheets in the book. These are prefect for photocopying. Interactive, colourful versions of each activity are on the CD. Activities on the CD can be printed out or used on an interactive whiteboard. Each of the 34 different strategies includes at least two variations. The first example is aimed at younger, less able children. The second example is aimed at older, more able students. Each example can be customised to be simpler, more challenging, or cover a different area of the curriculum. This makes the book and CD an infinite source of resources for teaching Maths. All of the activities engage children and promote debate to develop their existing ideas. They are deliberately designed to make children talk. This happens with minimal support, giving the teacher time to successfully assess what the children are saying. This is a set of resources for teaching maths that encourages learning and assessment. A book that truly understands what assessment for learning and formative assessment is all about.